A new collaborative study led by a research team at the Department of Energy's Pacific Northwest National Laboratory, University of California, Los Angeles and the University of Washington could provide engineers new design rules for creating microelectronics, membranes and tissues, and open up better production methods for new materials. At the same time, the research, published online Dec. 6 in the journal Science, helps uphold a scientific theory that has remained unproven for over a century. Just as children follow a rule to line up single file after recess, some materials use an underlying rule to assemble on surfaces one row at a time, according to the study. Nucleation—that first formation step—is pervasive in ordered structures across nature and technology, from cloud droplets to rock candy. Yet despite some predictions made in the 1870s by the American scientist J. Willard Gibbs, researchers are still debating how this basic process happens. The new study verifies Gibbs' theory for materials that form row by row. Led by UW graduate student Jiajun Chen, working at PNNL, the research uncovers the underlying mechanism, which fills in a fundamental knowledge gap and opens new pathways in materials science. Chen used small protein fragments called peptides that show specificity, or unique belonging, to a material surface. The UCLA collaborators have been identifying and using such material-specific peptides as control agents to force nanomaterials to grow into certain shapes, such as those desired in catalytic reactions or semiconductor devices. The research team made the discovery while investigating how a particular peptide—one with a strong binding affinity for molybdenum disulfide—interacts with the material. "It was complete serendipity," said PNNL materials scientist James De Yoreo, co-corresponding author of the paper and Chen's doctoral advisor. "We didn't expect the peptides to assemble into their own highly ordered structures." That may have happened because "this peptide was identified from a molecular evolution process," adds co-corresponding author Yu Huang, a professor of materials science and engineering at UCLA. "It appears nature does find its way to minimize energy consumption and to work wonders." The transformation of liquid water into solid ice requires the creation of a solid-liquid interface. According to Gibbs' classical nucleation theory, although turning the water into ice saves energy, creating the interface costs energy. The tricky part is the initial start—that's when the surface area of the new particle of ice is large compared to its volume, so it costs more energy to make an ice particle than is saved. Gibbs' theory predicts that if the materials can grow in one dimension, meaning row by row, no such energy penalty would exist. Then the materials can avoid what scientists call the nucleation barrier and are free to self-assemble. There has been recent controversy over the theory of nucleation. Some researchers have found evidence that the fundamental process is actually more complex than that proposed in Gibbs' model. But "this study shows there are certainly cases where Gibbs' theory works well," said De Yoreo, who is also a UW affiliate professor of both chemistry and materials science and engineering. Previous studies had already shown that some organic molecules, including peptides like the ones in the Science paper, can self-assemble on surfaces. But at PNNL, De Yoreo and his team dug deeper and found a way to understand how molecular interactions with materials impact their nucleation and growth. 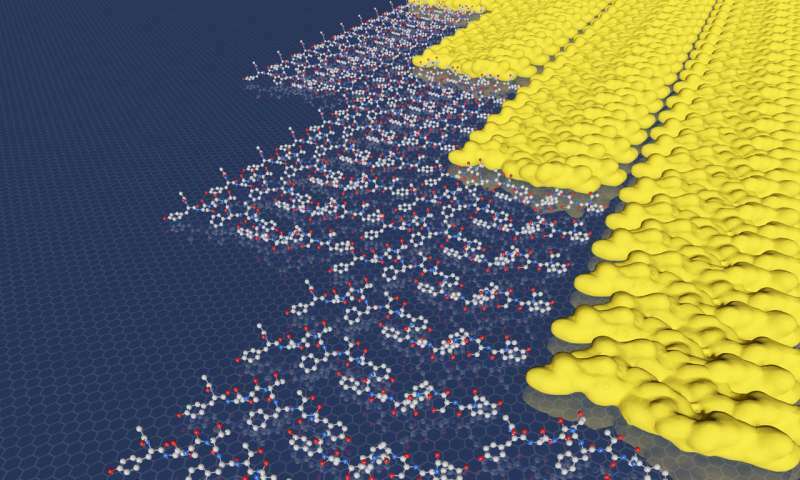 They exposed the peptide solution to fresh surfaces of a molybdenum disulfide substrate, measuring the interactions with atomic force microscopy. Then they compared the measurements with molecular dynamics simulations. De Yoreo and his team determined that even in the earliest stages, the peptides bound to the material one row at a time, barrier-free, just as Gibbs' theory predicts. The atomic force microscopy's high-imaging speed allowed the researchers to see the rows just as they were forming. The results showed the rows were ordered right from the start and grew at the same speed regardless of their size—a key piece of evidence. They also formed new rows as soon as enough peptide was in the solution for existing rows to grow; that would only happen if row formation is barrier-free. This row-by-row process provides clues for the design of 2-D materials. Currently, to form certain shapes, designers sometimes need to put systems far out of equilibrium, or balance. That is difficult to control, said De Yoreo. "But in 1-D, the difficulty of getting things to form in an ordered structure goes away," De Yoreo added. "Then you can operate right near equilibrium and still grow these structures without losing control of the system." It could change assembly pathways for those engineering microelectronics or even bodily tissues. Huang's team at UCLA has demonstrated new opportunities for devices based on 2-D materials assembled through interactions in solution. But she said the current manual processes used to construct such materials have limitations, including scale-up capabilities. "Now with the new understanding, we can start to exploit the specific interactions between molecules and 2-D materials for automatous assembly processes," said Huang. The next step, said De Yoreo, is to make artificial molecules that have the same properties as the peptides studied in the new paper—only more robust. At PNNL, De Yoreo and his team are looking at stable peptoids, which are as easy to synthesize as peptides but can better handle the temperatures and chemicals used in the processes to construct the desired materials. The concept of growing a surface by adding "one row at a time, barrier-free" reminds me of big-O calculations comparing algorithms in computer science. In this molecular situation, different versions of the process require different amounts of thermal e^-kT energy to overcome a reaction threshold. A lower threshold means a faster reaction rate at a given temperature. On the other hand, adding one row at a time means there are fewer new reaction sites available at any given instant. This my slow the rate -- though that was not mentioned here. "It appears nature does find its way to minimize energy consumption and to work wonders." This indeed is the least action vector inherent in the composition of universal work processes.